I know there are curmudgeonly food people out there who are down on Food TV, specifically the high-octane food competition shows that command such a large audience on Bravo and Food Network. But this is a story of how one of those shows inspired me to turn an ordinary weeknight dinner (one of my killer salads) into something totally new and unexpected. To start, you have to understand that my killer salad doesn’t have lettuce in it. It’s a salad built of stuff: cherry tomatoes, English cucumber, red onion, an orange pepper, chickpeas, and blue cheese all tossed with a balsamic vinaigrette that I make myself. I almost always serve it with the best bread I can find at the store. It’s meant to be healthy, but it really isn’t. And I make it again and again and again. 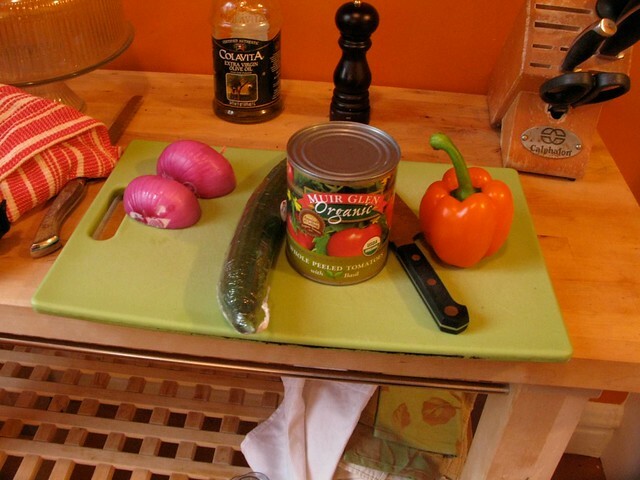 Only, last week I came home with all of the ingredients and then watched an episode of “Top Chef Masters” on DVR before Craig came home. And watching these chefs in action–their resourcefulness, their creativity–I was suddenly inspired to do something more interesting with the food I had waiting there in the kitchen. So I did the following. 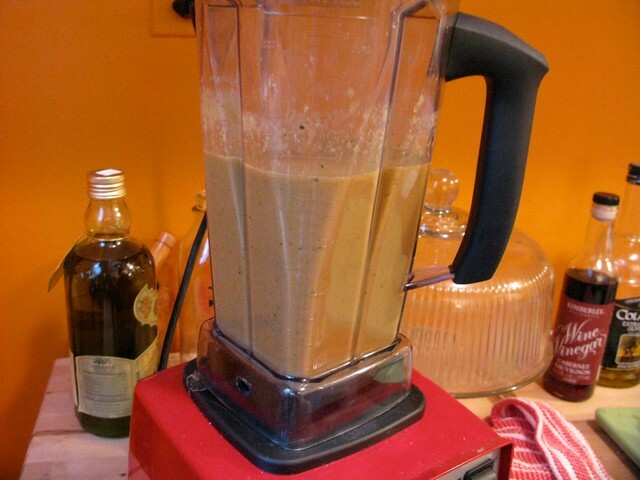 I rough chopped half the red onion, half the orange pepper, 3/4s of the cucumber, and two cloves of garlic and threw them in the blender with a can of tomatoes (juices reserved, to adjust the texture of the soup as I blended it), a big splash of olive oil (1/4 cup? 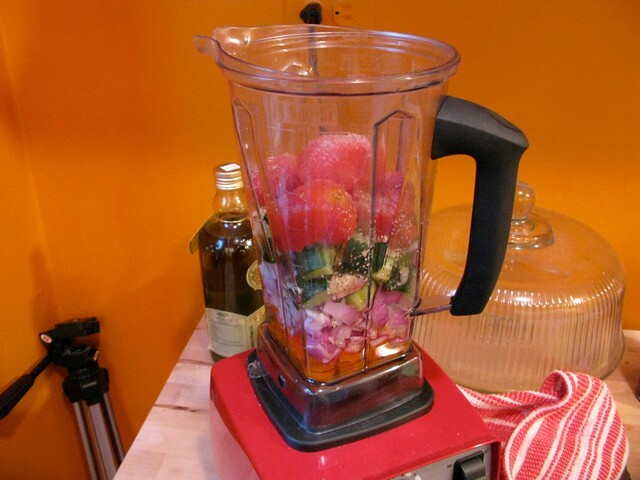 ), a big splash of red wine vinegar (also 1/4 cup? ), salt and pepper. I put the lid on and turned on the motor and BEHOLD! I took a taste and you know how sometimes a baseball player will step up to the plate after a season on the bench and hit a home run? Ok, I don’t know anything about that (not a big sports guy) but I imagine that metaphor is apt because this tasted like a crowd of people leaping to their feet in unison letting out a collective roar. I took the remaining bits of onion and cucumber and red pepper and the cherry tomatoes and cut them up into smaller bits to serve as a garnish. What was left? 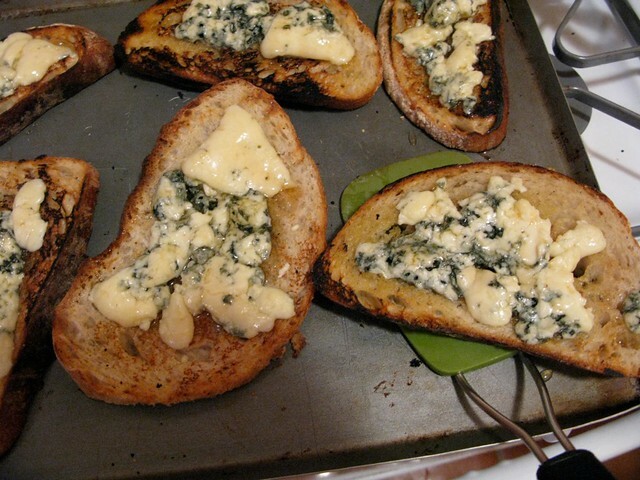 The loaf of bread and the blue cheese; so I decided to make blue cheese toasts. 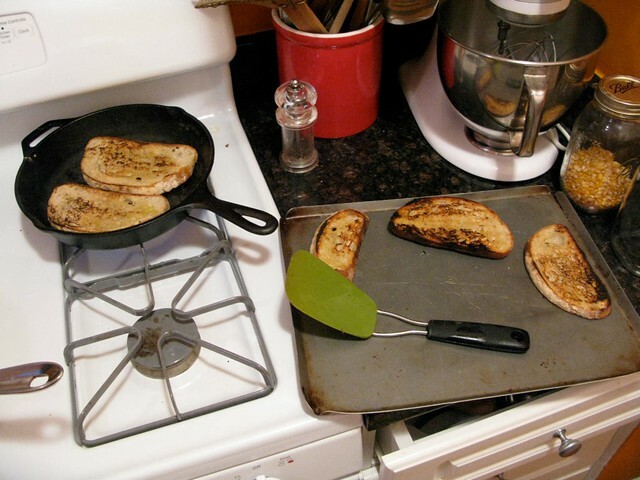 I wanted the bread to be toasty in a rustic sort of way–as if I toasted it on a grill–so I heated up my cast iron skillet, sliced the bread thickly and then brushed it with olive oil. I placed it in the very hot pan and pressed the white inner part down with a spatula so it got some color. See? Oh, I also preheated the oven to 400 degrees. When all the bread was toasted in that rustic sort of way, I topped all of the pieces with the blue cheese I brought home (a cheap Danish one; if I’d known I was going to do this, I would’ve bought Gorganzola) and placed them on a cookie sheet which I put in the oven with the light on, waiting until the cheese was just melty. Trust me, this is a pretty sublime combo. 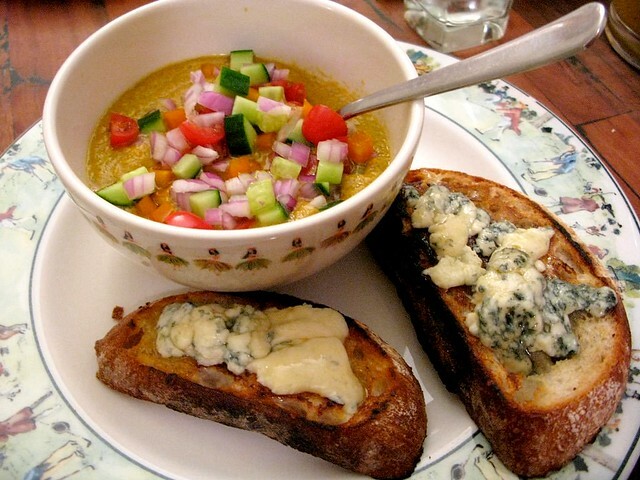 And together with the soup, it made for a very filling, very lovely dinner.